Why should I use a designer with 3D home design capabilities? Writing this in 2017 its easy to say 3D home design is certainly not a new technology (I have been using it for 10+ years already, in computer time that is a lifetime). The biggest difference now is that with modern hardware, software, and more experienced designer it is becoming a tool that is no longer a luxury, but a necessity. 3D designing started all the way back with hand renders. With today’s culture of need it now, and wanting to see multiple versions of something hand rendering has become a less used tool to show a project. In order to keep up with the pace of the modern world people moved to computer drafting and rendering using software like Chief Architect. With these tools, designers like us at Interactive 3D Home Designs can create a design and make endless changes in a very short amount of time. This technology has changed the way people design forever, not only does it help designers and clients to achieve their goals and effectively visualize space requirements, 3D renderings can also allow home owners to have the same idea of the project as builders without having to know how to read architectural plans. Newer technology typically has new benefits. 3D home design coming from 2D is no different. Being able to take a flat 2D projection and give it depth, life and character really brings out what a home can be. Having these capabilities can allow home owners or companies to see a final product and determine if it is exactly what they want or if they need to do some more research and make some changes to their plans. I cannot count how many times I have had clients come to me saying “I have to have (Insert some color hardwood or something they saw on Houzz) in my house” only to look at it in 3D and realize that it does not work with their home. It could be their home does not have the same shape, style, or size that they saw in the photo but being able to see it helps them save from costly change orders. One aspect of 2D design that is better than 3D is for construction documents. If you are building a home you cannot just have 3D pictures of it, you need to have details, elevations, and plans. When I first started in this industry I remember my boss telling me often “A pretty picture can sell a job but can it be built”. If you do not have the documentation to build something all you really have is a pretty picture, in today’s world the only way to provide that is with 2D construction plans. When a designer works in 3D technology, the design he makes is typically done in a single model. With this in a single model making large changes to finishes can be done in the blink of an eye. With the software, we use all it takes is the push of a button and we can change your entire house from a brick exterior to siding. See all the possibilities side by side so you can accurately determine which version suits your style the best. A proficient designer can design a 2D floor plan, and all he needs to do is push a button and you have both a floor plan and a render of the space. If you would like to see an example of how fast some of these designs can be done take a look at our example here. 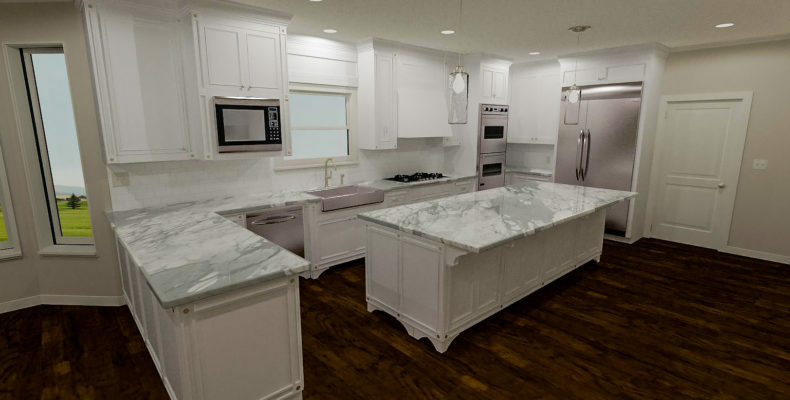 Designing your home in 3D gives a much more accurate representation of the final product compared to what you get with a traditional floor plan. As we mentioned, thanks to the accuracy and flexibility of 3D modeling, designers are able to spend more time on completing other tasks, and less time on the preparation process. See the exact same finished product that your builder sees so you both know what you are expecting. This drastically reduced the amount of miscommunication that leads to change orders and unneeded delays on your job site. Are you ready to experience the benefits of 3D technology and achieve your goals in a more efficient and sophisticated way? If the answer is yes, then you already know what to do. Contact us today and see what it takes to help you see your dream and how we can benefit you and make your dream a reality!